July 2017: There is an FPA Traders Court guilty vote against this company. The FPA recommends caution dealing with MyGoldenSignals until this issue is resolved. Purchased his 5 minute strategy and 20 minute strategy and was also a part of his university. I followed both strategies perfectly, which includes keeping an eye on Bloomberg news for key speakers and pay attention to high impact economic news on forexfactory.com .I ended up wiping out my whole account. His strategies are a joke, he doesn't even know how to use them properly. He says you can only trade the strategies when market conditions exist, which is once a week, twice at most. He is very misleading in his videos, doesn't show losses and trades with a demo account. Do not get involved with him and his strategies or you will wipe out your whole account. 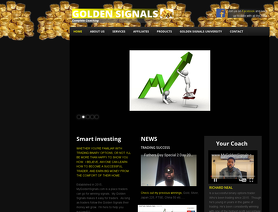 Richard Neal and My Golden Signals is a scam!!! On March 15, 2017 I purchased a 20 Minute Nadex Binary Strategy from Richard Neal through his website My Golden Signals. I did so based on his claims that this strategy has a 90% ITM win rate. As advertised in his YouTube Videos, the strategy was very simple to use and place trades with. However, from April 10, 2017 thru June 1, 2017 I used the strategy to make 100 trades (1 contract each) on my Nadex Demo Account. Out of 100 trades taken, only 73 closed ITM resulting in a very disappointing win rate of 73%. As it became apparent that he scammed me with false win rate results, I requested a refund 3 different times. His only reply was to my first request in which he stated I wasn't following the strategy according to "certain times" to trade. Since I had followed the rules to the letter (as shown in my trade record that I sent him) his reply was invalid double-talk. The Nadex platform has a blue background at the top for Live accounts and a green background for Demo Accounts. Scammers don't reveal the top of their platform in their promotional YouTube videos. This is important because it reveals that they don't have real money on-the- line in the trades on their videos. This is the method Richard Neal and My Golden Signals uses as well. Beware of Richard Neal and his business My Golden Signals. He will scam you!